More than one in five central Auckland property sales, or transfers, in the past three months were to overseas buyers, new Stats NZ data reveals. Central Auckland, or the Waitemata ward, includes the CBD and sought-after suburbs like Parnell, Grafton, Herne Bay, Ponsonby, and Westmere. Stats NZ property statistics manager Melissa McKenzie says that 22%, or 321, of Waitemata sales went to people who didn’t hold NZ citizenship or a resident visa in the June 2018 quarter. This is up from the 19%, or 225, sales to overseas buyers seen in the March 2018 quarter. It is also significantly up from the 84 sales to overseas buyers seen at the same time last year. But the share of property sales to overseas buyers fell in many other parts of Auckland in the June 2018 quarter. Further, McKenzie says that the share of property sales to overseas buyers for Auckland as a whole also fell in the June 2018 quarter. There were to 6.5%, or 741 sales, to overseas buyers in June, as compared to 7.3%, or 678 sales in the March 2018 quarter. Meanwhile, the share of property sales to overseas buyers nationwide were also down in the June 2018 quarter. Overseas buyers were responsible for 2.8% of sales in the June 2018 quarter, as compared to 3.3% in the March 2018 quarter. However, McKenzie says the number of sales to overseas buyers actually rose in the June quarter – in line with a rise in the total number of sales in the quarter. 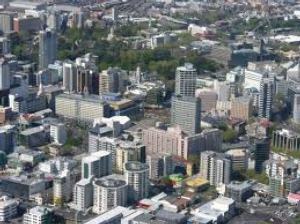 “Over three-quarters (78%) of property sales were to New Zealand citizens in the June quarter. Eleven percent of property sales were to companies and other corporate entities and information on the ownership of these corporates (by New Zealanders or overseas people) is not currently available.